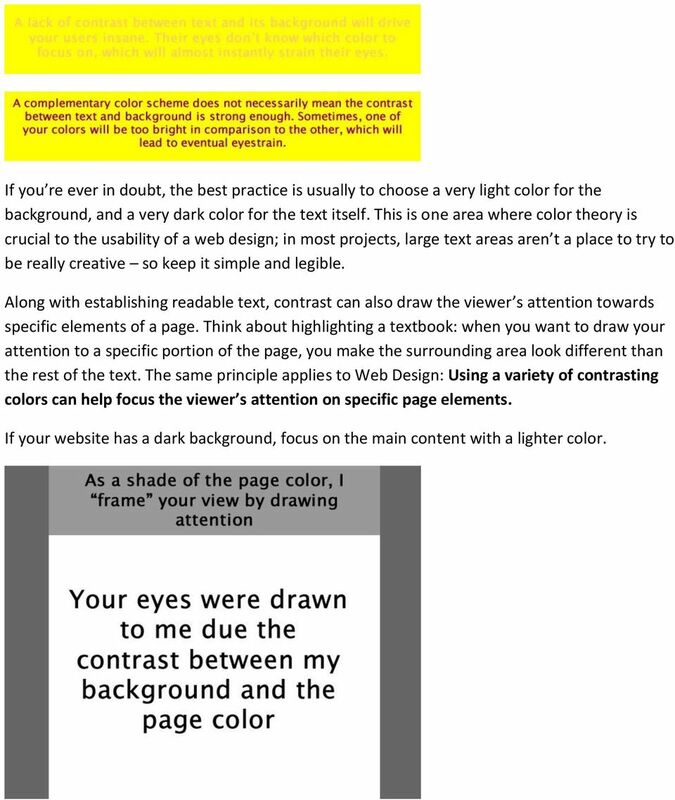 Download "Reading 4.2 - An Introduction to Color Theory for Web Designers"
2 If you re ever in doubt, the best practice is usually to choose a very light color for the background, and a very dark color for the text itself. 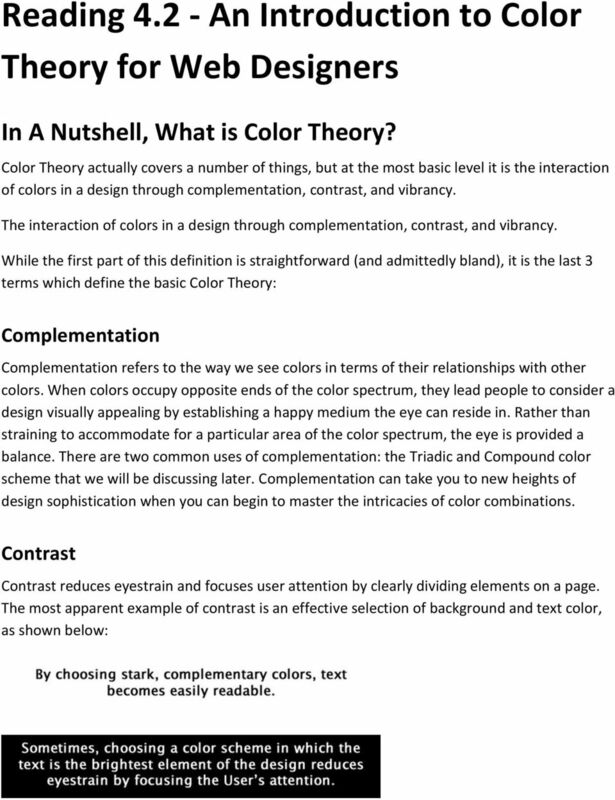 This is one area where color theory is crucial to the usability of a web design; in most projects, large text areas aren t a place to try to be really creative so keep it simple and legible. Along with establishing readable text, contrast can also draw the viewer s attention towards specific elements of a page. Think about highlighting a textbook: when you want to draw your attention to a specific portion of the page, you make the surrounding area look different than the rest of the text. The same principle applies to Web Design: Using a variety of contrasting colors can help focus the viewer s attention on specific page elements. If your website has a dark background, focus on the main content with a lighter color. 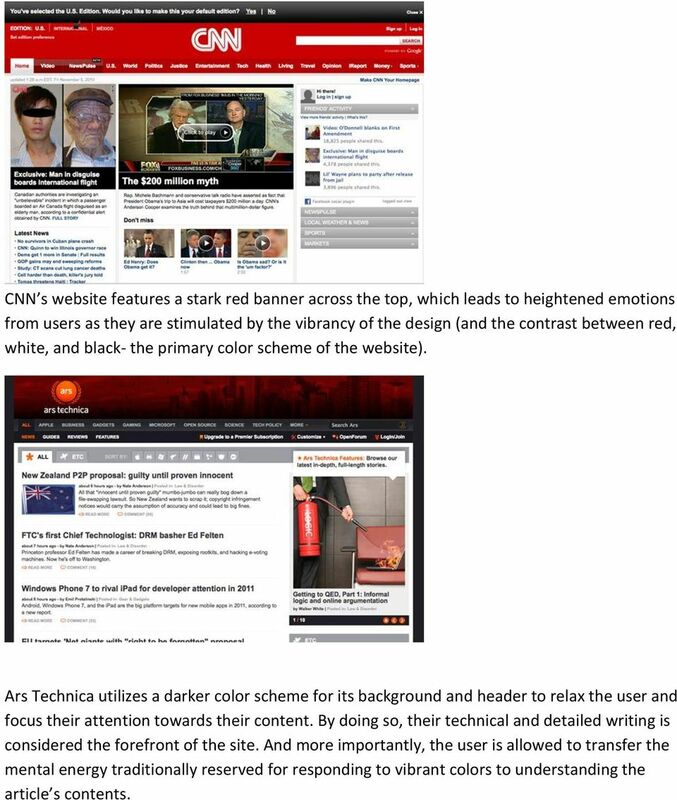 4 CNN s website features a stark red banner across the top, which leads to heightened emotions from users as they are stimulated by the vibrancy of the design (and the contrast between red, white, and black- the primary color scheme of the website). Ars Technica utilizes a darker color scheme for its background and header to relax the user and focus their attention towards their content. By doing so, their technical and detailed writing is considered the forefront of the site. And more importantly, the user is allowed to transfer the mental energy traditionally reserved for responding to vibrant colors to understanding the article s contents. 5 How Do I Select an Effective Color Scheme? Here are 3 of the commonly accepted structures for a good color scheme: triadic, compound, and analogous: Triadic Color Scheme Composed of 3 colors on separate ends of the color spectrum. 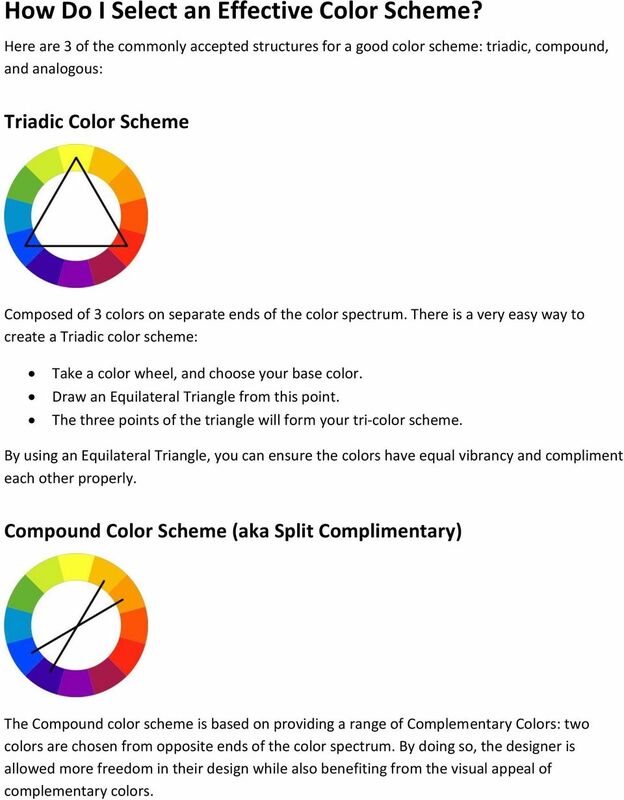 There is a very easy way to create a Triadic color scheme: Take a color wheel, and choose your base color. Draw an Equilateral Triangle from this point. The three points of the triangle will form your tri-color scheme. By using an Equilateral Triangle, you can ensure the colors have equal vibrancy and compliment each other properly. Compound Color Scheme (aka Split Complimentary) The Compound color scheme is based on providing a range of Complementary Colors: two colors are chosen from opposite ends of the color spectrum. By doing so, the designer is allowed more freedom in their design while also benefiting from the visual appeal of complementary colors. 6 Analogous An Analogous color scheme is based on a careful selection of colors in the same area of the color spectrum. Usually the colors are differentiated by their vibrancy, and their contrast when compared to each other. Two examples of an Analogous color scheme are: Shades Yellow and Orange A Monochromatic Selection (Shades of a base color) Just the Beginning The beauty of where we are in history right now is that we can benefit from centuries of scientific and artistic color theorists. 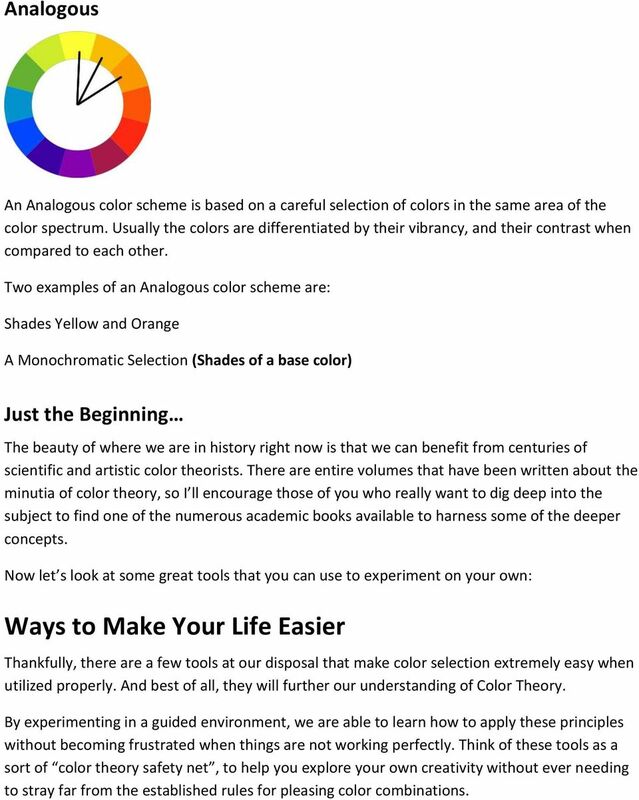 There are entire volumes that have been written about the minutia of color theory, so I ll encourage those of you who really want to dig deep into the subject to find one of the numerous academic books available to harness some of the deeper concepts. Now let s look at some great tools that you can use to experiment on your own: Ways to Make Your Life Easier Thankfully, there are a few tools at our disposal that make color selection extremely easy when utilized properly. 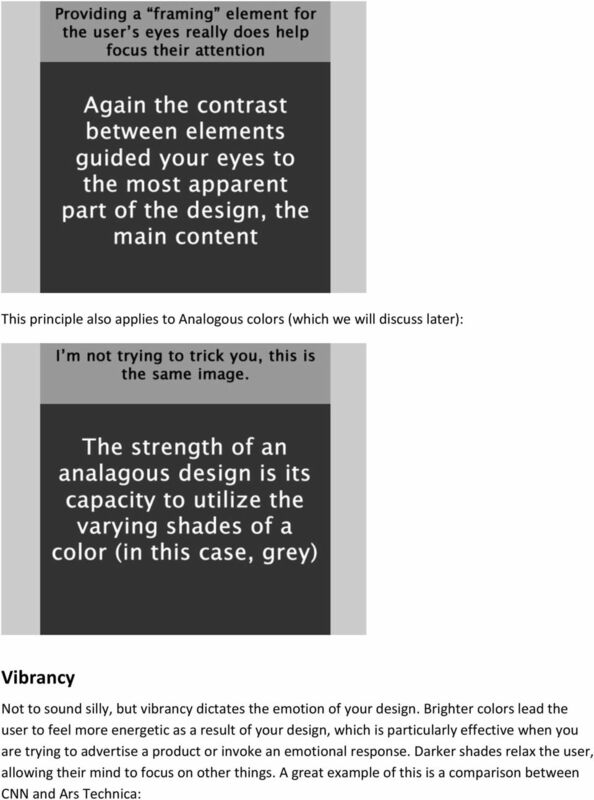 And best of all, they will further our understanding of Color Theory. By experimenting in a guided environment, we are able to learn how to apply these principles without becoming frustrated when things are not working perfectly. Think of these tools as a sort of color theory safety net, to help you explore your own creativity without ever needing to stray far from the established rules for pleasing color combinations. 8 This tool is quickly becoming my preferred choice for absolute beginners, those with little patience, or people on a deadline. By providing a very simple and controlled selector, Color Scheme Designer provides a very low barrier of entry, and its choice of color principles present a variety of options. 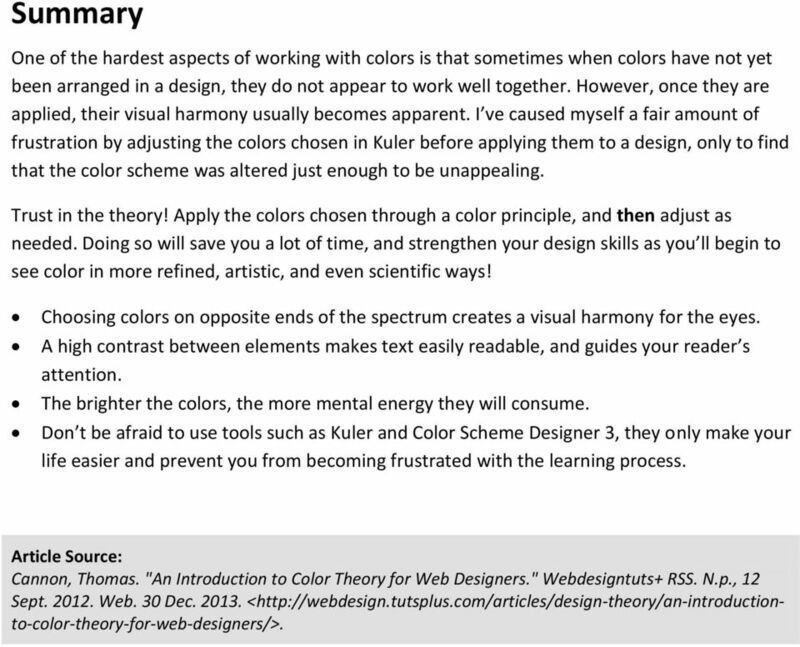 While it doesn t teach its users why the colors work well together (Kuler s dynamic color wheel is much more effective in that regard), its results are great as a starting point or to finish a prototype. 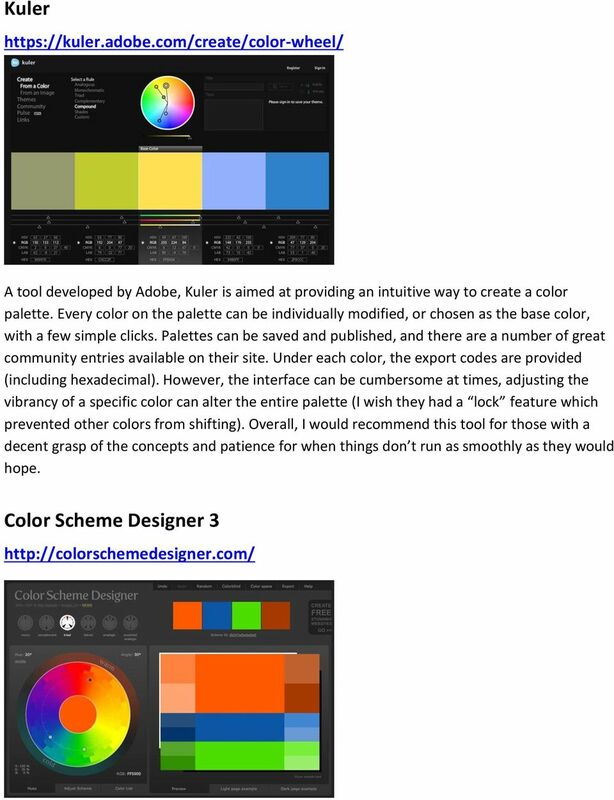 Its more advanced options are very useful: features such as the ability to adjust an entire palette s saturation and contrast, color blind overlays, and sample website previews are things I hope Kuler implements very soon. 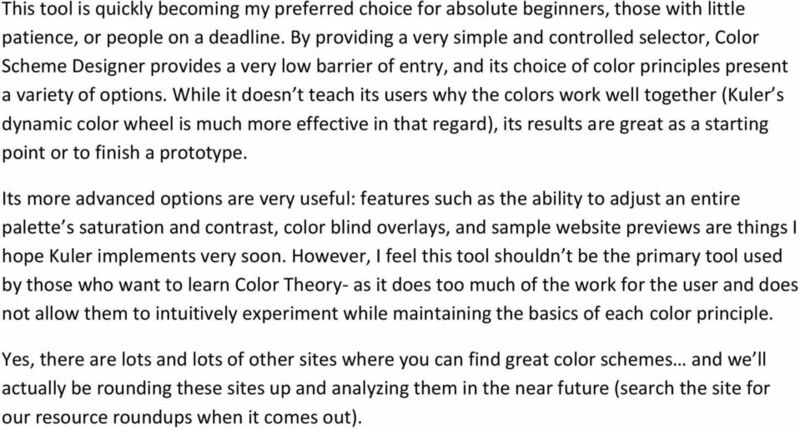 However, I feel this tool shouldn t be the primary tool used by those who want to learn Color Theory- as it does too much of the work for the user and does not allow them to intuitively experiment while maintaining the basics of each color principle. Yes, there are lots and lots of other sites where you can find great color schemes and we ll actually be rounding these sites up and analyzing them in the near future (search the site for our resource roundups when it comes out). 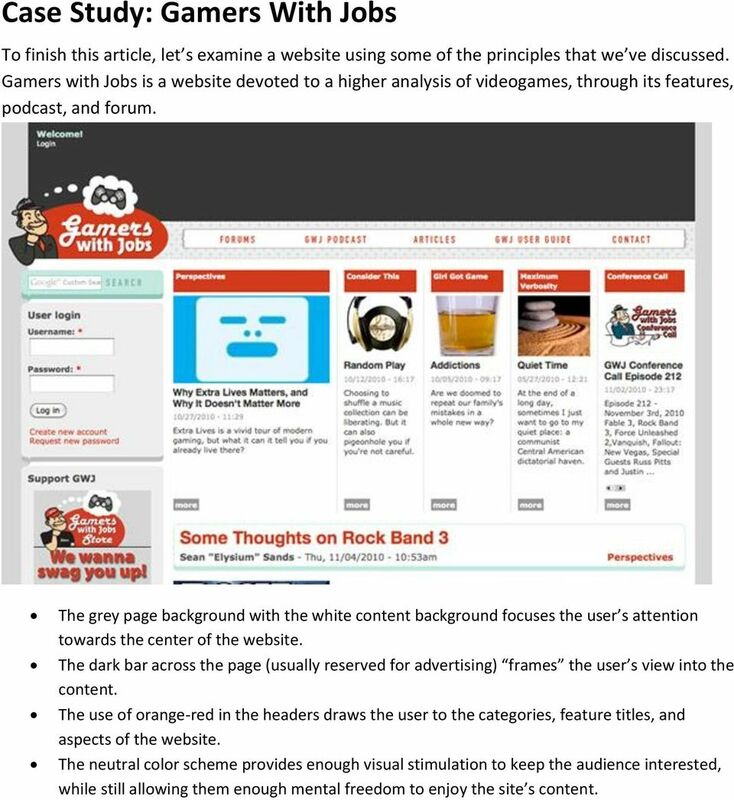 9 Case Study: Gamers With Jobs To finish this article, let s examine a website using some of the principles that we ve discussed. Gamers with Jobs is a website devoted to a higher analysis of videogames, through its features, podcast, and forum. The grey page background with the white content background focuses the user s attention towards the center of the website. The dark bar across the page (usually reserved for advertising) frames the user s view into the content. The use of orange-red in the headers draws the user to the categories, feature titles, and aspects of the website. The neutral color scheme provides enough visual stimulation to keep the audience interested, while still allowing them enough mental freedom to enjoy the site s content. How To Create Your Own Profitable Banners In Minutes! How to make a custom Joomla template!